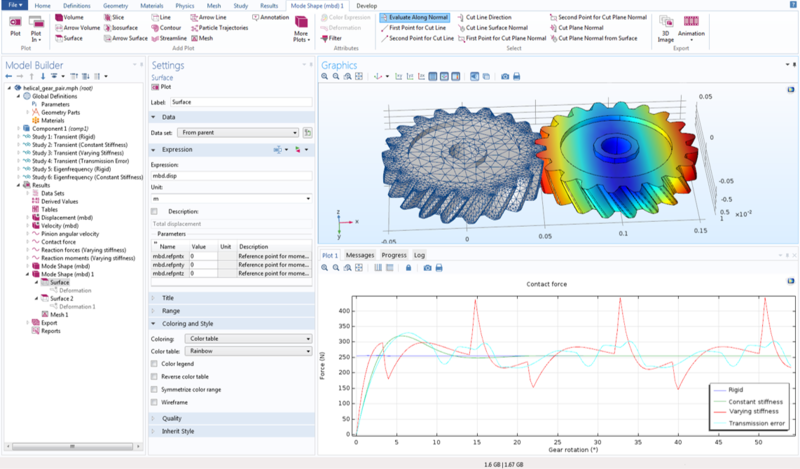 For users of the Multibody Dynamics Module, COMSOL Multiphysics® version 5.2a brings the ability to model gears, which is useful for power transmission and automotive simulations. A variety of gear components have been added to the Parts Library for easy model setup, and many newly added tutorial models illustrate potential applications for this user-driven functionality. Read about the complete updates to the Multibody Dynamics Module below. 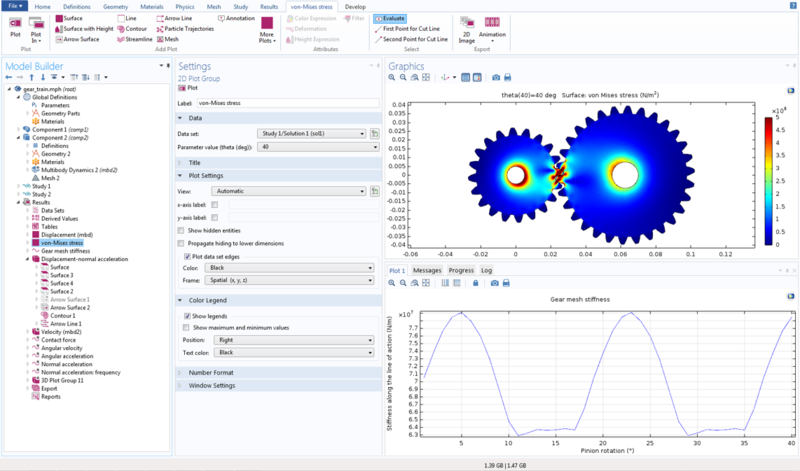 Functionality for modeling gears has been added to the Multibody Dynamics interface. You can model a system of gears used for power transmission. There are nodes available for several types of gears and racks, including: Spur Gear, Helical Gear, Bevel Gear, Worm Gear, Spur Rack, and Helical Rack. 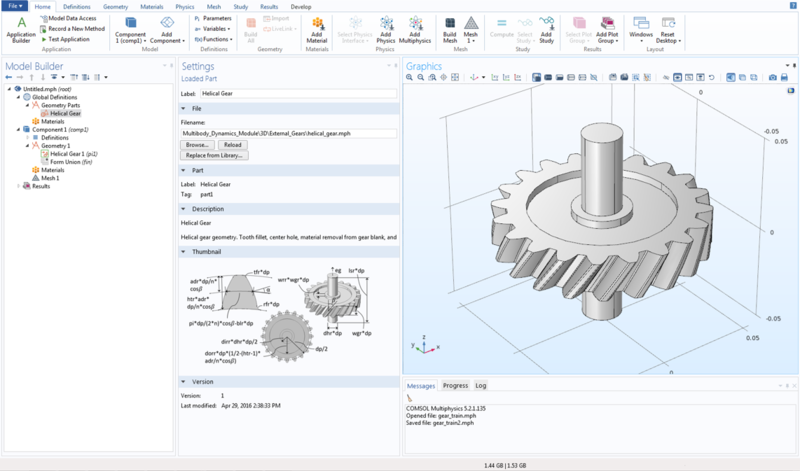 A gear can be connected to other gears by adding the following nodes to the model tree in the Model Builder: Gear Pair, Worm and Wheel, and Rack and Pinion. 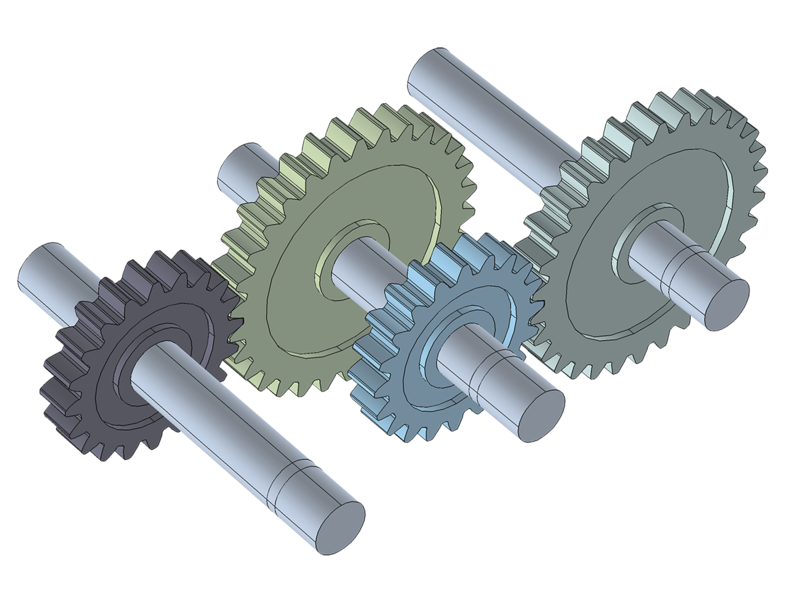 A compound gear train, modeled using the new Gears functionality in the Multibody Dynamics interface. In the Model Builder, a gear is defined as a rigid body. However, it is also possible to specify a finite stiffness for a gear mesh when connecting to other gears. In the Model Builder, a Gear Elasticity node can be added as a subnode to a Gear Pair node in order to define the elastic properties of the gear mesh, such as mesh stiffness, mesh damping, and contact ratio. A pair of gears can be assumed to be an ideal pair without any static transmission error or backlash. When there is a static transmission error, which could be due to geometrical errors and geometrical modifications, a Transmission Error subnode can be added to the Gear Pair node. Such examples include a gear running out, misalignment, or the occurrence of tooth tip and root relief. Similarly, in the case where there is a backlash that affects the dynamics of the system, a Backlash subnode can be added to the Gear Pair node. Furthermore, a Friction subnode can be added to a Gear Pair node to account for frictional forces at the contact point. Frictional forces are dominant only when there is a significant slip at the contact point. The slip could be due to the change in the center distance or if the axes of both gears are neither parallel nor intersecting. The worm and wheel pair is an example of this type of operation, where an inherent slip is present even under perfect conditions. 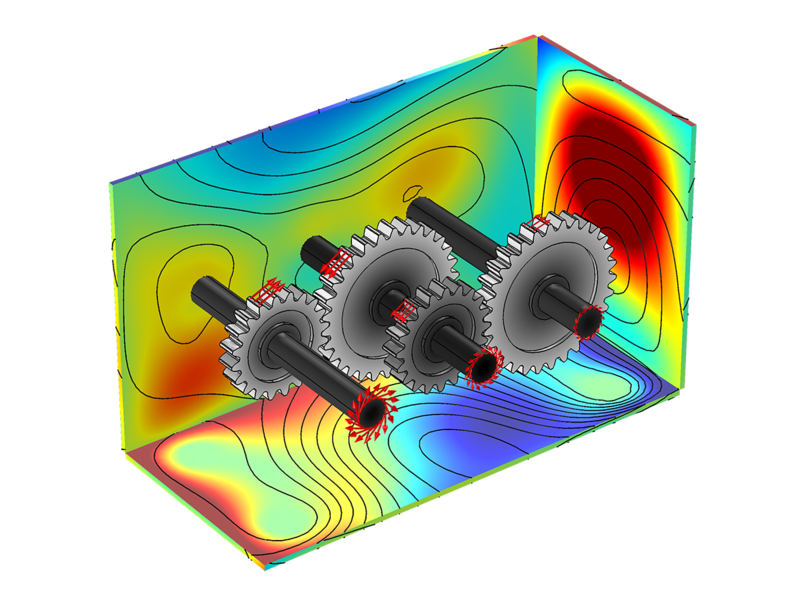 A number of parameterized gear geometries have been added to the Parts Library. Different types of gears can be created using these parts for both 3D and 2D models. The input parameters of the parts can be modified to customize the gear tooth and gear blank shape. These parts can be used to build a gear tooth, a single gear, a pair of gears, or a parallel or planetary gear train. There are additional separate parts to create the tooth cross section for all types of gears. 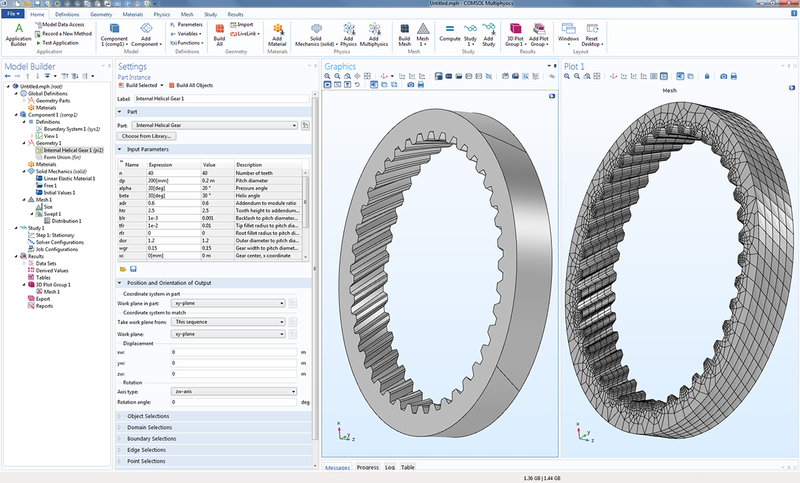 A helical gear geometry, created using the gear parts available in the Parts Library of the Multibody Dynamics Module. A differential gear mechanism, allowing the two axles of the vehicle to rotate at different speeds. The magnitude of the speeds and direction of the rotations are shown. This model simulates vibrations in a compound gear train. Spur gears, used to model the gear train, are mounted on rigid shafts and where the shafts are supported by elastic housing on both ends. The gear mesh is assumed to be elastic with varying stiffness, which is the source of sustained vibration. A transient analysis is performed to compute the dynamics of the gears as well as the vibrations in the housing. Contact modeling is used for the computation of the gear mesh stiffness. A parametric analysis is performed to compute the gear mesh stiffness as a function of gear rotation in one mesh cycle. The model calculates the von Mises stress distribution in the gear pair, where the stresses are high at the contact points, as well as at the roots of the teeth. 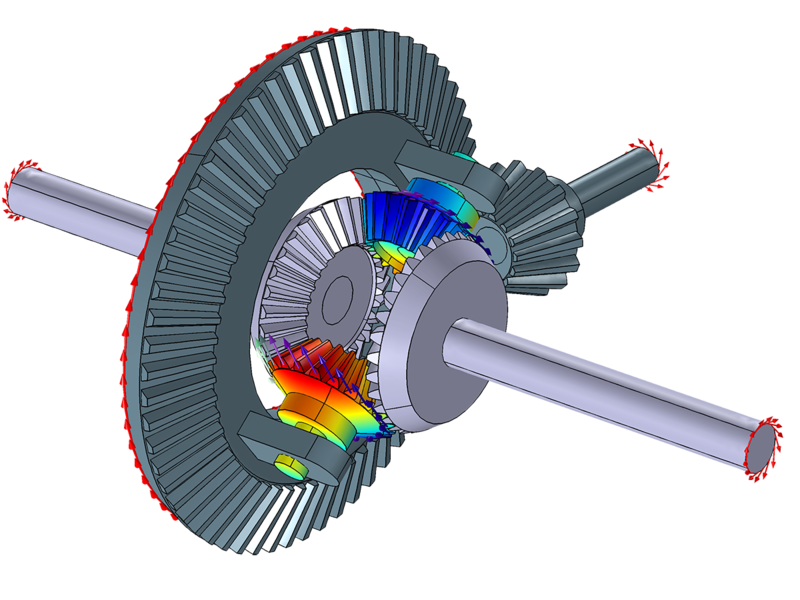 The gear mesh stiffness, displacement in the gears, and the normal acceleration in the housing due to vibration are also calculated. The normal acceleration in the housing due to the vibrations induced by the elastic gear mesh. Also shown is the grayscale plot of the displacement of the gears. This tutorial model illustrates the dynamics of helical gears. It considers the case where the gear mesh is assumed to be rigid or elastic. A transient study is performed to analyze the effect of constant gear mesh stiffness, varying gear mesh stiffness, the transmission error on the contact force, and the angular velocity of gears. An eigenfrequency analysis is performed to compute the natural frequencies and mode shapes of the gear pair for the rigid and elastic gear meshes. 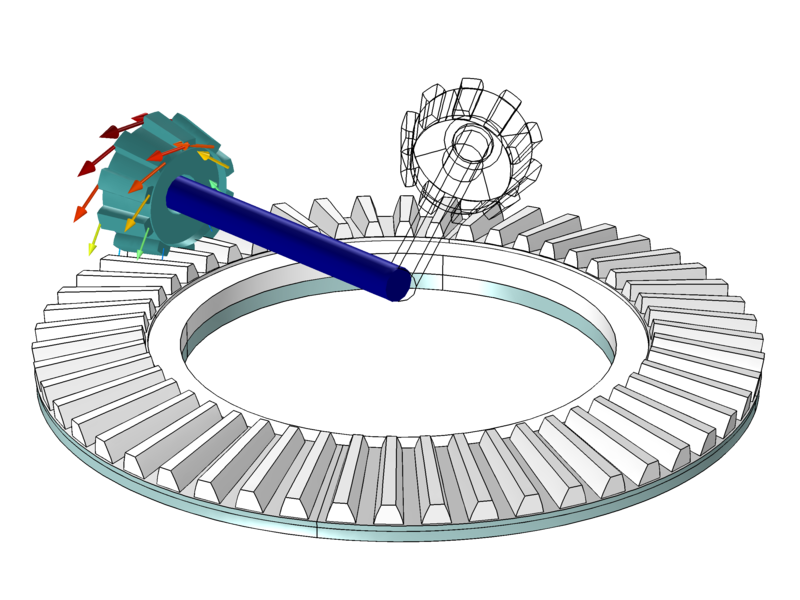 This tutorial model simulates a pair of straight conical bevel gears. The gears are modeled as rigid, but one of the gears is fixed while the other is hinged on a rigid bar. The rigid bar is also hinged at a point lying on the axis of the fixed gear. A transient analysis is performed to compute the forces and moments at the center of the fixed gear. The results of the analysis are compared with the results of a reference from an international journal. The motion of a bevel gear when an incremental rotation is prescribed to the rigid bar.